Take your adventures into the dark places of the world. 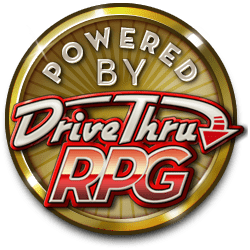 e-Adventure Tiles: Dungeons Vol. 1 is designed to add ease, detail and excitement to your campaign; never worry about mapping on the spot again! 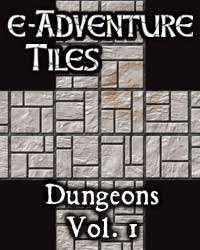 e-Adventure Tiles: Dungeons Vol. 1 contains everything you need to print out and construct a sprawling network of rooms and passages. This e-Adventure Tile set contains 25 six by six inch square tiles, for over six square feet of adaptable, interchangeable, and ready-to-use adventure terrain (and that is only counting each tile once - you can print them as much as you like)! e-Adventure Tiles feature the artwork of RPG cartographer Edward Bourelle and is designed for use with your favorite miniatures. This title was added to our catalog on October 15, 2003.